The Royal Botanic Gardens, Kew is proud to announce the recipient of this year's Kew International Medal is Mary Robinson, a world-leading advocate for environmental and human rights, and the first female President of Ireland. The Medal is awarded to individuals for distinguished, internationally-recognised work aligned with RBG Kew's mission. Mary has been selected for her integral work on climate justice: the notion that the growing impacts of climate change are wiping out opportunities for the world's poor, when they have contributed the least to greenhouse emissions. This connects directly with human dependency on plants, especially in relation to agriculture, crops, and therefore food security in the wake of climate change. "This is a great honour for me. We face unprecedented losses of biodiversity and rapid environmental change. The invaluable scientific work that RBG Kew does globally is helping to conserve and sustain the plants and crops that matter to supporting local communities for a sustainable future. We will only succeed in securing climate justice if we stay true to the science. We desperately need fact-based, evidence-based science to determine the global policy agenda." 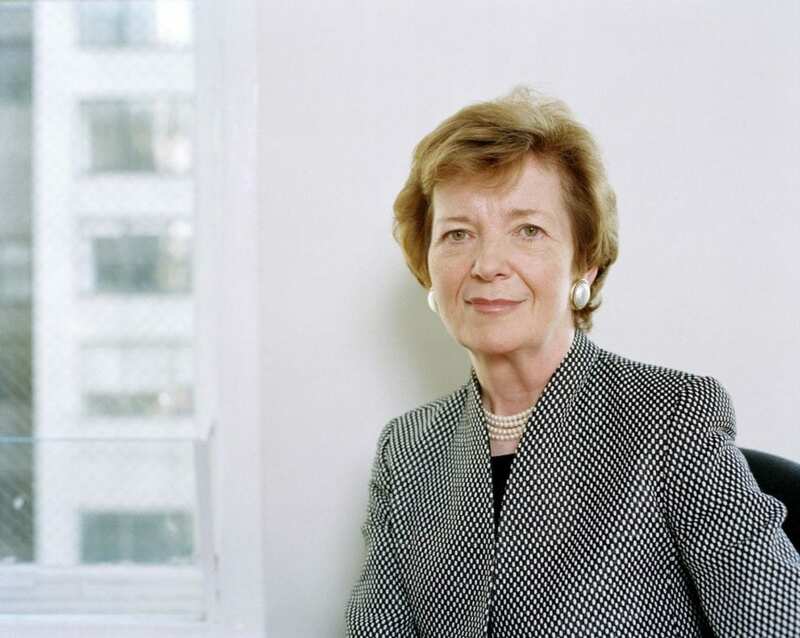 It is the interconnectedness of science, policy, and people's lives that lies of the heart of Mary's work as both an esteemed member of The Elders – a group of global leaders working together for peace and justice – and as founder of the Mary Robinson Foundation – Climate Justice. Through her Foundation, Mary has been involved in projects in Malawi, Bangladesh, Colombia, Ecuador and Ethiopia, transforming these areas of the world, influencing policy, and seeing real action taken to build climate resilience and enhance food security in communities most at risk. Mary advocates strongly for climate justice to feature at the forefront of education, working to engage young people in pressing scientific issues to inform and inspire the thought leaders of the future. She is passionate about communicating and engaging with people on a humanitarian level, to increase awareness about the threats facing the environment, plant life, and the humans that depend on it: a mission that lies at the very heart of Kew's own ethos. Kew's own work in this area, such as the critical research being done on the Enset crop in Africa, and on controlling crop pests seeks to drive positive impact in much the same way. "A charismatic and influential leader of our times, Mary Robinson is an international champion of climate justice, and an expert at communicating to a wide audience the importance of conserving the natural world. With this award we want to acknowledge the integral work Mary has done to advocate the pressing issue of food security, and to raise awareness about the impacts of climate change on our planet." Kew is actively working to raise public awareness of the actions needed to achieve the UN Sustainable Development Goals by 2030 as they relate to tackling food insecurity, developing more sustainable agriculture, and protecting ecosystem services through cutting-edge research in partnership with hundreds of institutions worldwide. The Royal Botanic Gardens, Kew is a world-famous scientific organisation, internationally respected for its outstanding collections as well as its scientific expertise in plant diversity, conservation and sustainable development in the UK and around the world. Kew Gardens is a major international and a top London visitor attraction. Kew's 132 hectares of landscaped gardens, and Wakehurst, Kew's Wild Botanic Garden, attract over 2.1 million visits every year. Kew was made a UNESCO World Heritage Site in July 2003 and celebrated its 250th anniversary in 2009. Wakehurst is home to Kew's Millennium Seed Bank, the largest wild plant seed bank in the world. Kew receives approximately one third of its funding from Government through the Department for the Environment, Food and Rural Affairs (Defra) and research councils. Further funding needed to support Kew's vital work comes from donors, membership and commercial activity including ticket sales. The Kew International Medal was first established in 1992 by the Board of Trustees and is given to individuals who have made a significant contribution to science and conservation and the critical challenges facing humanity. Previous recipients include Sir Robert and Lady Sainsbury (1994); Sir David Attenborough (1996); Stella Ross-Craig (1999); Margaret Stones (2000); Mary Grieson (2003); Peter H. Raven (2009); Jared Diamond (2012); E. O. Wilson (2014); Dr Kiat W. Tan (2015); Professor Sebsebe Demissew (2016); and President Juan Manuel Santos Calderón (2017). As well as being the former President of Ireland (1990-1997), Mary Robinson is a former United Nations High Commissioner for Human Rights and Special Envoy on Climate Change. She sits on the advisory board of Sustainable Energy For All (SE4All), is a member of the Lead Group of the Scaling Up Nutrition (SUN) Movement, and board member of several organisations such as the European Climate Foundation. Mary is a member of The Elders, a group of independent global leaders brought together by Nelson Mandela in 2007 to work for peace, justice and human rights. Mary is a former chair of the Council of Women World Leaders. In this exciting epoch of female empowerment, Kew recognises eminent female scientists among its staff, and is glad to honour another prominent female advocate for science.